This image is of the 10mb level of the stratosphere which is the equivalent of approx. 15-16miles or 85,000feet above sea level. Just like when we show ridges and troughs at 500mb they exist at this level as well. The first image below is right now. Notice how the vortex is displaced on the wrong side of the globe. In the second image Very simply stated the red area circled over the arctic indicates the stratospheric warming event taking place; the result of which has cause the stratospheric vortex to split into two lobes, one of which displaces over north America. THIS IS GOOD. 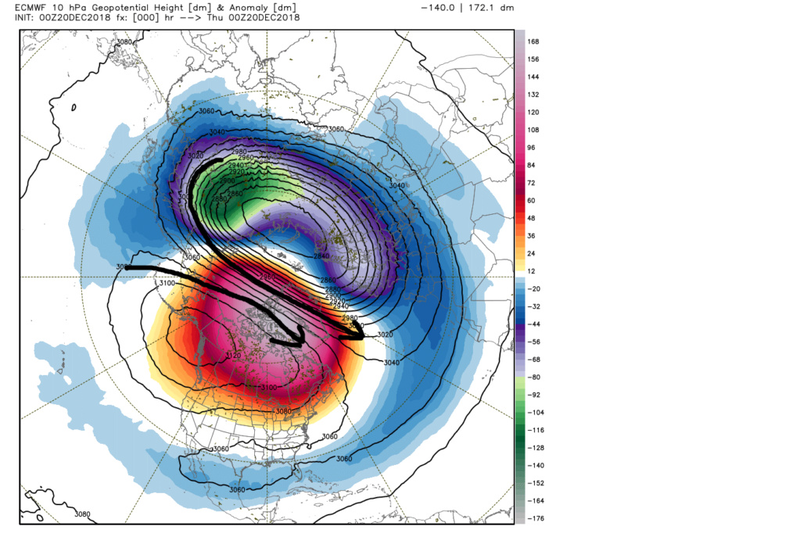 The other important thing this warming event does is weakens the vortex. The reason being is that it weakens the temp gradient. Just like the jet streams down closer to earth the wind moves in large part due to the temp gradients between the lower latitudes and higher latitudes. When the strat temps are cold there is a much larger temp difference between the air over the arctic vs the equator. The result is much tighter gradient and and much stronger faster circulating vortex. This acts like a noose trapping cold air in the higher latitudes. When a sudden stratospheric warming event occurs, it effectively brings the temp gradient prev discussed closer which effectively weakens the movement of air slowing it down; weakens the noose if you will. Now this is the first part. We now have a weaker noose. 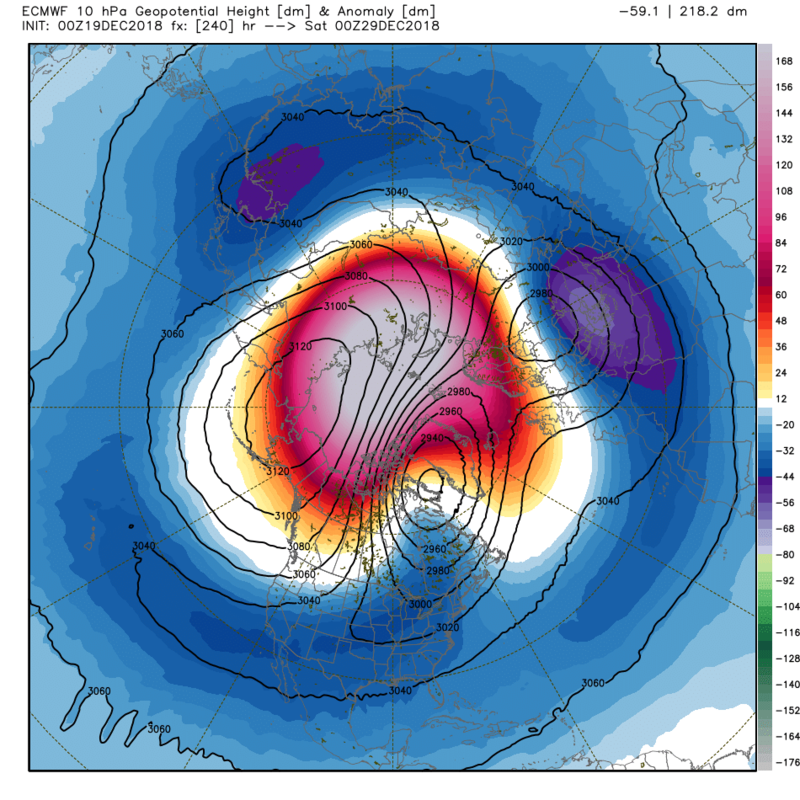 Now picture the arctic air and polar masses like a balloon sitting centered on the N pole. Above the baloon is the stratosphere. Ok so A massive warming just took place. What happens to the air molecules at any level when they warm? The air expands right? As air warms the molecues get more excited and spread out; as they cool they condense and become more dense. If you cant follow take an empty water bottole with a cap on it at room temp and put it in the freezer. after a few hrs the bottle will appear to have collapsed on itself. Then take it out and put it next to the heater. After a few hrs here you will see it expand as the pressure builds. Anyway back the the strat. When a large area of air at the level of the strat warms like this the air will do the same thing, expand. Since the strat is so high up in the atmosphere and almost "in space" the expanding air has an easier time expanding downward rather than up into space. 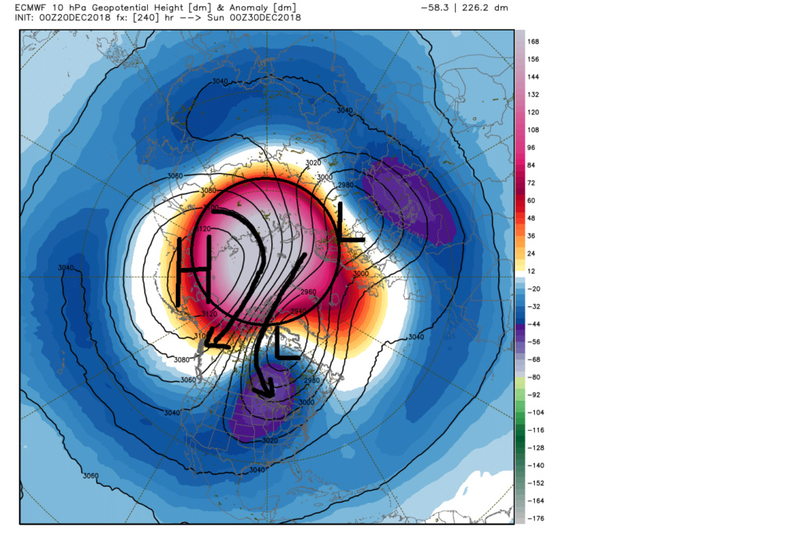 As it does so it pushes on the "balloon" of arctic and polar air. Picture placing a small balloon on a globe in your house. Now pretend your fist is the strat. Now push your fist down slowly over the center of the balloon. This represents the expanding stratospheric air pressing down on the tropspheric air(where we live). What happens? As you press down on the balloon the balloon spreads out and drifts southward into the mid lattitudes of your globe right? This is essence, and very very simply stated, is what happens when the strat warms. The strat warms which loosens the grip on the cold air. As it expands it presses down on the troposphere allowing the discharge of cold air masses south into the mid latitudes. Momma thatis essentiall what the image Frank posted is showing. A serious strat warming that weakens and almost obliterates its overall structure, such that it splits into two smaller vorticies. This WILL set us up very nicely for a long stretch in Jan should it verify. Yes that static image is 240hrs away but as I mentioned in prev posts what everyone is complaining about now is actually the precursor to what you see in that image. The wheels have already been set in motion. Here was the quote from the9th write up: Ironically its the less than ideal/crappy next 10-14days that seems to be the precursor to such an event. So like taking medicine we will have to swallow it reluctantly; however, knowing that after the course of medicine is finished healthier times lie ahead.